When I wrote The Yellow Easter Dress, I based it on some true events in my life when I was a young girl around 10 and 11. I did live on a hobby farm, I remember one year (there was probably more than one year this happened) when we did have a heavy snowfall on the first day of spring, we did have rabbits that were born one year on Easter morning, and every year when I was young my mother did sew me an Easter dress. In fact, she sewed most of my clothing until I learned how to sew, and then I sewed my own dresses. I have many memories of going to the fabric store, picking out patterns and fabric! And I did give away my yellow Easter dress to a clothing drive that sent the clothes to the Appalachian region. When I wrote this story, I often thought about the pattern for the dress. I didn’t have it anymore, and neither did my mother. A year ago I was asked to read The Yellow Easter Dress at our church’s spring brunch for women and girls. I decided to add some pictures to the story through a Power Point presentation. As I was looking for photos, on a whim I decided to look for the pattern. Well, internet search engines are amazing things because I did find the pattern! The year was probably 1968 and I was ten years old. 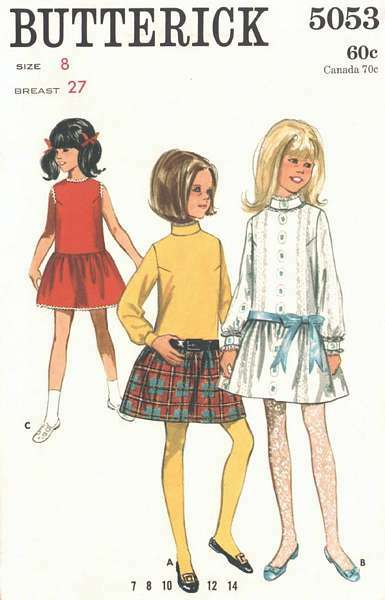 The drawing does reflect that era, but it seems that little girl’s dresses never go out of style. I’m sure any girl today would love to wear this dress! Although I didn’t add any lace or ribbon to the yellow dress in the story, my dress was similar to view B – I had lace on the sleeves and the neck and around the waist was lace with a yellow ribbon woven through it. It truly was a very pretty dress and I felt very special wearing it.